Home / Cupcake / Dogs in costumes, OH MY!!! As hoomans, we aren’t the biggest fans of Halloween. You know, the weird people obsessed with dressing up. I had a friend in college, Wade, who chose to dress up like a woman every single year. Shaved his legs. Had full make up and wig. I have absolutely nothing against the beloved transvestite, but for real, he was a little overboard. Anyway, like I was saying, we hoomans are not so kind to dressing up. 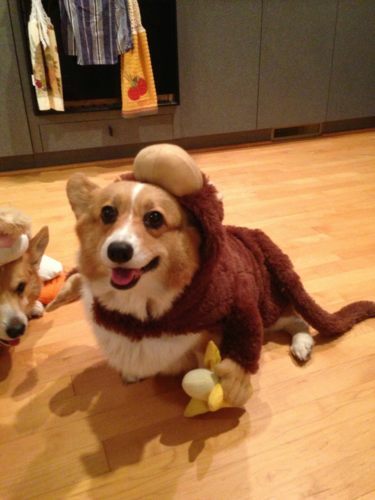 HOWEVER, and that is a BIG one, we love Halloween for the awesome dogs in costumes barrage. WE LOVE IT!!! So what about those dogs in costumes? This post is for sheer enjoyment and chuckles. And a few awwwws. We were introduced to the dog costume many moons ago. Here is Hambone as a hot dog. This is when Target had super high quality pet costumes. I mean, talk about quality. We still have it. Isn’t he adorable? I love this guy. A few years later, I put Wolfgang in the same one. OMG! I posted some of these on Reddit, and got a ton of karma. Whew! This was the first time we coordinated their outfits. It was so nuts trying to get them to not shake off the antennas. Of course, Hambone is not thrilled. I think this was the last year that Target put out super nice costumes. Both of these are pretty amazing. The fabric and detail are solid. This photo of Cupcake is the most popular photo on our Instagram account. She is so cute we put it on a shirt! Previous post: PawPack is HERE!!! Next post: Holiday gifts for 2014 XMAS are here!